22nd June, 2016: When builder Anil Aggarwal’s Skyline Construction Co approached Axis Bank for a project loan for RNA Exotica in 2011, the bankers forgot simple arithmetic. On two separate instances — in 2011 and in 2013 — Axis Bank’s SME loans division gave loans of Rs 75 crore and Rs 100 crore against hugely inflated mortgages of floor space in RNA Exotica. The flat size was inflated by 500 to 700 square feet per flat, and the number of unsold flats mortgaged was inflated by a couple of hundred flats in 2013. Anil Aggarwal, like Anil Kapoor (you know, the chap who sang, “One-two-ka-four, four-two-ka-one, my name is Lakhan”) sang a seductive song to Axis Bank executives, who were more than willing to be seduced. 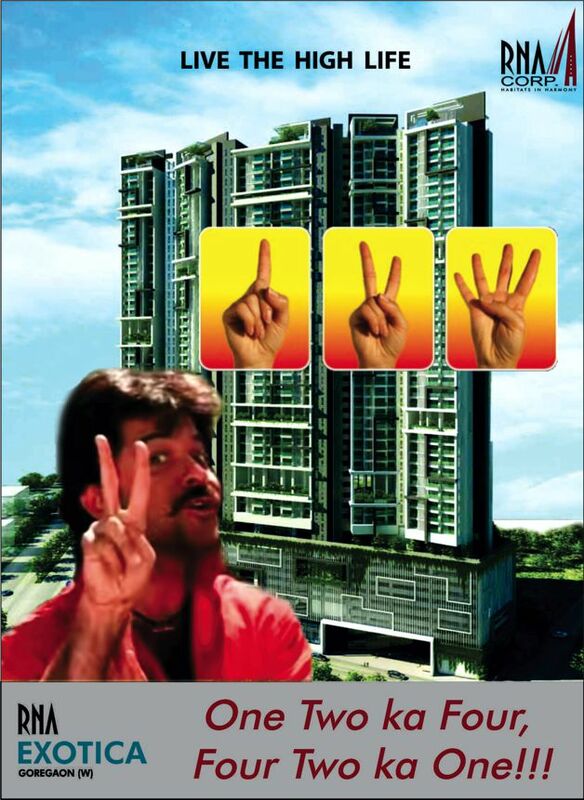 The late Anil Aggarwal’s version of one-two-ka-four sounds like this: “770 square feet flat ka 1299 and 979 sq. ft. ka 1650… My name is RNA Corp! Jadoogar Anil Agarwal said 168 sold flats in 2011, but 66 sold flats in 2013. Numbers mein kya rakha hai? 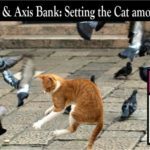 Now gimme your money, sweetheart.” The sweethearts at Axis Bank gave the builder a Rs 75 cr line of credit in March 2011, and beefed it up to Rs 100 crore in March 2013, even as the value of the collateral fell sharply! Skyline Construction Co’s registered mortgage deeds in 2011 (and 2013) based on inflated and unverifiable figures, viz. 1299, 1650 and 1699 sq. ft. The correct sizes i.e. carpet areas, viz 770 and 979 sq. ft. are readily available through the flats’ sale agreements. Sale deed for flat no. 1403 in B-wing booked by film producer Kushan Pritish Nandy shows 770 sq. ft. carpet area. Skyline Co.’s registered mortgage agreement with Axis Bank shows the same flat as 1299 sq ft. So, Axis Bank’s record is inflated by a whopping 529 square feet for every such 2BHK flat in RNA Exotica! The sale deed of flat no. D-1903 booked by actor Arif Zakaria shows 979 sq. ft. whereas the mortgage deed shows 1650 sq. ft. So, RNA Corp has represented to Axis Bank that this flat is 671 sq. ft. larger than its actual carpet area! And Axis Bank has unquestioningly accepted this figure as a basis for its mortgage! This raises the question whether Axis Bank has double-standards – one for people like you and me, and another for people like Anil Aggarwal. Would Axis Bank have sanctioned a loan against our flats if you and I cited Super Built Up area instead of the carpet area? RNA’s Skyline Construction Co.’s March 2011 loan was of Rs 75 crore. In March 2013, Skyline prepaid the RNA Exotica project loan and got the mortgage released, and immediately took a fresh loan of Rs 100 crore. Unsold flats of RNA Exotica were mortgaged to Axis Bank. The 2011 mortgage deed shows the number of sold flats as 168 (2,41,350 sq. ft.), with a table of flat-buyers’ names and flat numbers. The 2013 mortgage deed claims that the number of sold flats supposedly dropped down to 66 (i.e. 94,951 sq. ft.). How? 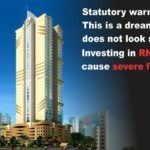 Did Skyline sales staff spend two years buying back over 100 flats from investors, instead of selling additional flats? There is no table of sold and unsold flats in the March 2013 mortgage deed. Why this reduction in the number of sold flats? Because RNA Corp, which had gone to town in 2010 claiming that RNA Exotica would be a 48-storey tower, (i.e. 10 floors podium parking, one floor E-deck, plus 37 upper floors) was not getting MMRDA’s permission for building that many floors. The March 2011 mortgage deed is based on calcuations of 30 upper floors (i.e. 459 flats, 16 flats per floor). In March 2013, there is reduction of 35 flats. That means roughly two floors less, bringing the total to about 28 upper floors. But is that final? NO! According to a source at MMRDA, RNA Corp in June 2016 has permission to build only 21 upper floors. Frantic efforts are being made by the builder to get this raised to 25 upper floors. Even if such efforts succeed, further reduction of 48 flats will happen – i.e. a total reduction of about 80 flats. The top floor will be 36th floor (i.e. 10+1+25). The falling expectations show in the sale agreements. Whereas Kushan Pritish Nandy’s sale agreement registered in October 2014 said 30 upper floors, Arif Zakaria’s sale agreement in August 2015 mentioned 25 upper floors! If the building is of only 36 floors including podium, what will happen to flats such as these where sale agreements have been registered for flats on the 40th floor etc? 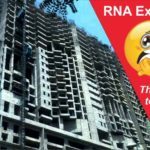 Will the investors be compensated by RNA Corp for not delivering of the promised flats after paying money and waiting for several years? All this financial jugglery for downplaying the risk of RNA Exotica becoming a Stressed Asset! RNA Corp has defaulted on smaller loans from Bank of India and State Bank of India. This auction notice says that RNA Corporate Park defaulted on SBI for Rs 61.50 crore, for which mortgaged land parcels in Palghar district will be auctioned. And this letter from Bank Of India to the secretary of RNA Royal Park, Kandivali, tells a similar story of default and bank recovery proceedings. SBI is struggling to recover an amount of Rs 61.5 cr by auctioning land plots that turned out to be under CRZ, and therefore valued at a fraction of the original projected values. Will the one-two-ka-four loan transaction of RNA Exotica and Axis Bank have a similar ending? Wait and watch. Thanks for the blog. Keep sharing more. @Mehul U R Right !! !